In the latest web development technologies, you have to deal with the asynchronous operation. Basically, the promises are a bit like event listeners except the following things. The promise can only succeed or fail once. It cannot succeed or fail twice or more, neither can it switch from the success to failure or vice versa. If the promise has succeeded or failed and you later add the success/failure callback, the correct callback will be called based on the output, even though the event took place earlier. The promise constructor takes in one argument: a callback function with two parameters called resolve and reject. We can use promise as the two different approaches. So, if we resolve the function, then we get the value inside then() block. 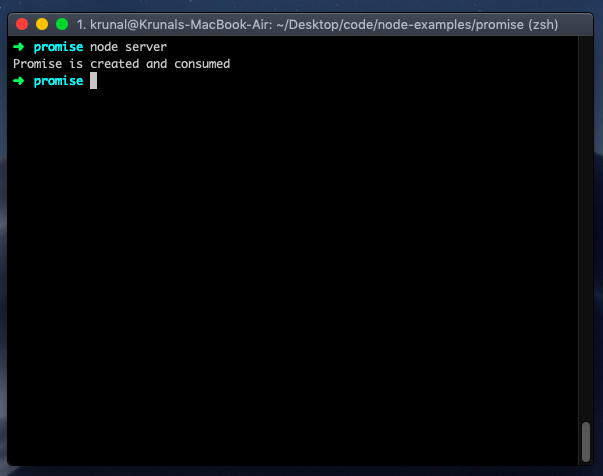 Let us take the following example and see the output inside the terminal. 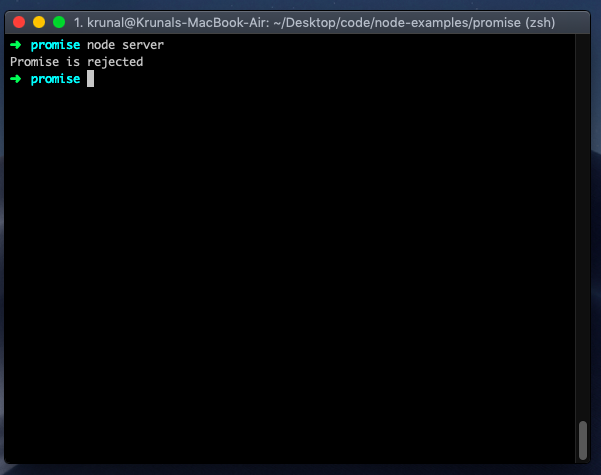 Now, run the above file in node.js by typing the following command. The promise is also rejected, and in that scenario, our code looks like below snippet. So understanding promises are not that difficult if the excellent example is provided. The executor initiates some asynchronous work typically, and then, once that completes, either call the resolve function to resolve a promise or else rejects it if an error occurred. If the error is thrown in the executor function, it means that the promise is rejected. The return value of the executor is ignored. The Promise is the proxy for the value not necessarily known when a promise is created. Promise allows you to associate the handlers with an asynchronous action’s eventual success or failure reason. This lets asynchronous methods return the values like synchronous methods: instead of immediately returning a final value, an asynchronous method returns a promise to supply a value at some point in the future. Pending: an initial state or pending state, neither fulfilled nor rejected. Fulfilled: meaning that the operation completed successfully. Rejected: meaning that the operation failed. It returns the promise that either fulfills when all of the promises in the iterable argument have fulfilled or rejects as soon as one of the promises in the iterable argument rejects the promise. If the returned promise fulfills, it is fulfilled with an array of the values from the fulfilled promises in the same order as defined in the iterable. If the returned promise rejects, it is rejected with the reason from the first promise in the iterable that rejected. It returns the promise that fulfills or rejects a.s.a. one of the promises in the iterable fulfills or rejects, with a value or reason from that promise. Returns the Promise object that is rejected with the given reason. It returns the Promise object that is resolved with the given value. Let us take an example of how we can use Promise with the async-await. So, in the output, you will get the 100. First, it will call the async function layer and then it will wait for the promise to be either fulfilled or reject then it will give us the output. Here, we have to use the setTimeout function to cause the manual delay of execution to simulate the AJAX request. If we reject then get the error object. Error handling in Promises is very easy because it gives once whether fulfilled or rejected. So it is the best replacement to the callback functions where callback hell is created.